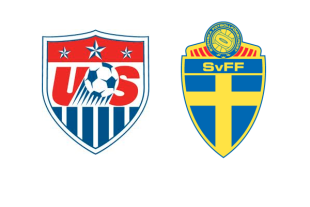 The US played to a scoreless draw with Sweden in their second match of the Women’s World Cup. Chances for both teams were at a premium with only three combined shots on goal — the US with two — between them. Jill Ellis made one change to the side that defeated Australia on Tuesday. Morgan Brian was inserted on the right side of the midfield and Christen Press was moved forward at the expense of Abby Wambach, who started on the bench. The first half saw few clear chances for either side. There was a moment of controversy midway through the half when Sweden’s Caroline Seger had her half-volley blocked by Sydney Leroux’ hand 6 yards from goal. Leroux seemed to extend her arm out to deflect the shot away and was lucky that the call was not made for the PK. The US attack relied almost exclusively on long balls into the box. Megan Rapinoe, Meghan Klingenberg, Ali Kreiger, and Morgan Brian were all guilty of lumping balls forward with no real target. The second half saw much of the same, but with the Americans controlling more of the possession. Amy Rodriguez, Abby Wambach, and Alex Morgan were all introduced in search of a breakthrough, but the Americans still failed to create many clear cut opportunities. Instead it would be the Swedes that would have the best opportunity to net a winner in the 78th minute. After the US failed to fully clear a corner kick, it was Seger again who latched onto a ball in the box and floated a half volley goalward from 15 yards out from the right side. The looping shot evaded everyone but was cleared off the line by Meghan Klingenberg, who headed the ball off the crossbar and out. The rest of the match petered out with few chances falling to either side. The Americans still lead Group D with four points and will look to win the group with a victory over Nigeria (Tuesday, 8 pm, Fox, NBC Universo, Fox Soccer 2Go, NBC Universo Now, NBC Deportes En Vivo Extra, SiriusXM FC). Dumping the ball toward the top of the box from a few yards inside the attacking half is clearly Plan A. In the first game it was targeting Abby Wambach and Sydney Leroux and against Sweden it was searching balls for Leroux and Press. While the dump, chase, and outwork method has worked for the US team in the past, the rest of the world has caught on. So what is Plan B? Is this team capable of playing through the midfield? Can the outside backs get forward more to work in more combination play? Can one of the strikers create a moment of brilliance on their own? The Swedes had the best chance of the game, but their chances were few and far between. Julie Johnston was the best player on the pitch for either side. The young center back was a monster in the air and strong in the tackle for 90 minutes. As Sweden tried to counterattack after a US corner, Johnston sprinted back 90 yards to break up the attack. Anyone worried that the youngster wouldn’t be up to the challenge of the World Cup can quash those fears. Meghan Klingenberg was again very solid at the left back position. She got forward as best she could on overlapping runs and was rarely the player caught in possession when the ball turned over. Plus the diminutive fullback used every ounce of her vertical leap to keep out the goalbound shot late in the second half. Becky Sauerbrunn quietly put in a solid performance partnering Johnston and was again strong distributing out of the back. Carli Lloyd and Lauren Holiday have not been an effective combination in the center of the midfield. Holiday’s passing prowess is lost in the deep lying central position. After Pia Sundhage made a few remarks regarding Lloyd in the press, many expected the midfielder to put in a sterling performance against her old coach. Instead it was the opposite, with the Delran native disappearing for large portions of the match. What’s the solution? Morgan Brian can play one of the central positions and Tobin Heath can be brought in on the wing. Boy it is hard to watch the U.S. play the game this way. Was hoping with Wambach on the bench the modus would change but it didn’t really. From my POV Morgan provides a needed spark and plays the game differently- hopefully she is healthy enough to play the whole game. It seems LeRoux gets a bit over anxious in the box and has missed a couple of chances or flubbed on some crosses that could/should be finished or executed a bit better. Needs to be better. This will not work in quarters or beyond. 1. Holiday was turning the ball over more than I would like, but more concerning was that she was serving up some real hospital balls for teammates. 2. JJ, as everyone has stated has been awesome. I love her poise and she just looks possessed on every play. She’s awesome. 3. Have to credit the Swedish structure, though. EVERY possession had 8-9 behind the ball. There were few player advantages and few triangles available. There is a reason they ran out of ideas in the final third. Having said that, keep passing and stay patient. Against the best teams, the US will need ot wear down the opposition. Two things I noted. The US was making a lot of passes that would have been fine on grass but were moving a bit too fast on turf and went too far for the receiver to catch up with. The other is that Megan Rapinoe continues to be a ball hog and needs to get rid of the ball quicker. I am inclined to see your point… but my rebuttal to that is the CONCACAF champions league final: Montreal v Club America. It was clear the Mexican team had no idea the speed of turf, (likely they never even played on it before) as evidenced by the breakneck speed of first half and them consistently overrunning on plays, poor approach angles, and poorly played passes that seemed to be just out of reach. Course it could just as easily been nerves but the angles were so obvious like they were a 1/2 step behind Montreal. That said, they came out after the first half and totally adjusted their play and the turf was no longer an issue at which point they totally dominated Montreal. I can see the women having a tough turf time but they should have adjusted by now…..like all the other teams. Couldn’t agree more about Rapinoe. I think her play is detrimental… consistently forcing a dribble when a pass is better thereby slowing down and not including the midfielders “we” seem to be hoping to see more of in the build up. If she were luring multiple defenders in… then offering a quality pass into the space abandoned…we would have no argument about her play– but that is not the case. Press and Brain provided nothing from the right side. I understand you want to bring along the youngsters, but time to put Heather O’Reilly in next game and watch someone who’s not slow and shy about taking on defenders. It will open up all sorts of options for everyone else around the box. Brian! Doh why isn’t edit button here, I just posted? Maybe this is a weak coach and the players rule. They are playing like they want to, damn tactics and damn the coach. the “girls ” listen to no one. they do what they want. This is not a new rumor. Just read between the lines.